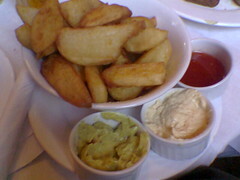 Lovely chunky potato wedges with guacamole (quite nice and spicy! ), hummus (great flavour) and tomato sauce. This is a lovely tasty snack — the only problem is that the chips are always dead hot but look lovely so you burn your tongue!! This entry was posted on Tuesday, December 20th, 2005 at 3:16 pm	and is filed under Lunch. You can follow any responses to this entry through the RSS 2.0 feed. You can leave a response, or trackback from your own site.